All in the Family, Quite a few from the “tribe”! Above info & photographs, Credit: pointblanknews.com; copy-writing, blogger’s. 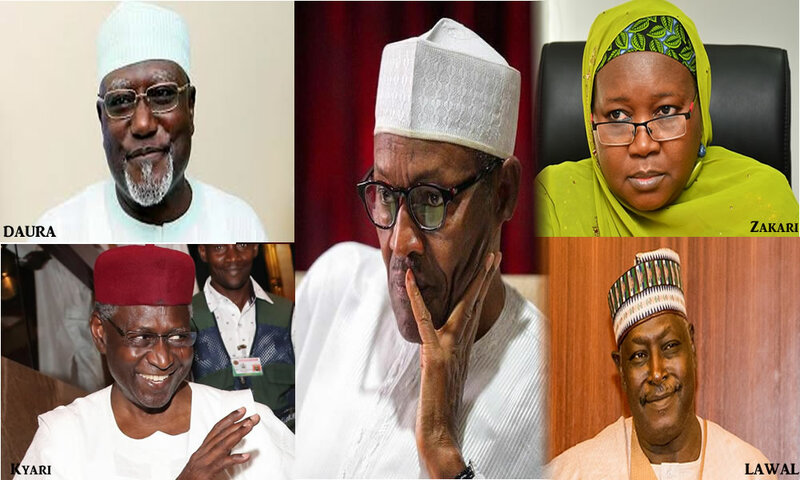 Above are new info to an essay on the growing Northern-ization of top appointments that I had been working on before I saw these worse nepotistic gathering that President Muhammadu Buhari supposedly surrounds himself with in a country of 150 million-plus population only early a.m. today. Fulani men are only after their cattle not after government or its policies and programmes. How can they carry weapons, to go and do what with? It is very apparent that the Sultan is deliberately avoiding the issue of the herdsmen, and from stats in this essay as well as from many media in Nigeria, he’s also very wrong on alleged “marginalisation” of the North which controls most appointments at “federal” level. As for Islamisation of the country, the evidences are all out there. How about the Sultan of Sokoto, the head of Muslims giving an order that over-rides government’s order on public holiday: after Tuesday and Wednesday July 5 and 6 had been declared public holidays for the Ramadan, a late announcement from the same Sultan – after workers had already stayed home for a day of the two named – added Thursaday, July 7 in a supposedly secular state! What an unfunny joke! What a travesty that lays bare the emptiness of the pretense at nationhood of a country whose Constitution is the result of the equivalent of back-door smoke-filled room that any powerful/privileged group can wipe their feet on. Who can forget how Sani Yerima of Zamfara State peed on the so-called Constitution and declared Sharia Law even while the indigenes of the state he governed were wallowing in abject poverty? Rather than have him challenged in court, Obasanjo was busy on grander designs of the evil Third Term. Nigeria has never recovered from that bare-face challenge to the near-worthless document that holds the various nationalities together since when one considers that the APC, a party supposedly born of progressive ideals could dare to speak out that it opposes a National Dialogue! Of course, there are strong assaults on Christianity in the Northern part of Nigeria with priests and regular Christians being slaughtered at perceived infractions against Islam in OTHER PARTS OF THE WORLD RATHER THAN NIGERIA. Most Christians in Nigeria today feel they have been betrayed by President Buhari in the area of acting as a protector of all Nigerians of every faith. Back to the reality of the North as the lopsided beneficiary of most “federal” appointments – in addition to the supposed nepotistic/sectional gathering around the President. *The real powerful positions in these promotions are apparent to Nigerians. While the press has widely carried Kachikwu’s slight job change as “removal” or “sack”, it is a description to be taken as mere semantics because it is apparent that the guy is still sitting pretty as one of Buhari’s top ministers. His divestment of one portfolio merely paved the way for a Northerner to become the GMD – see below. Chief Justice of the Supreme Court: Mahmud Mohammed (North). It is worth noting that since the end of late Chief Justice Ayo Gabriel Irikefe’s (present-day Edo State) term in 1987 after two years – a period of almost 30 years, and tenures of 8 different CJs, including the tenure of the current CJ, NO SOUTHERNER HAS BEEN APPOINTED TO HEAD THE APEX COURT. In Nigeria, far more (in number and experience) legal professionals exist in the south than in the north. It is also noteworthy that Nigeria’s first female CJ of the Supreme Court, retired Ms. Aloma Mariam Muktar is from Kano State (North) while the first (and present) female President of Nigeria’s Courts of Appeal, Justice Zainab Adamu Bulkachuwa, born in 1950 and called to Nigeria’s bar in 1976 is also from the (North). Chief Judge of Federal High Courts: Ibrahim Auta (North). Auta has been dogged by controversies in his career as a judge: the judge, whose Abacha kangaroo tribunal, like Pilate, delivered Ken Saro Wiwa (Ogoni minority and environmental rights) to the hangman. Ironically, he was appointed by President Jonathan, Saro Wiwa’s fellow riverine kinsman but Jonathan was never one with the capability of seeing such a big picture, such minutiae. NOTE: ‘Substantive’or without any description is a full/senior minister. “State”/”Junior Minister”, means the same thing. Amina Shamaki, Ministry of Health (North); Aliyu Bisalla, Ministry of Industry, of Petroleum Resources (North); Binta Bello, Ministry of Women Affairs;Babatope Ajakaiye, Federal Capital Territory (North); Rabi Jimeta, Ministry of Water Resources (North; minister also from the North); Bukar Hassan, Permanent Secretary, Ministry of Environment (North); Wakama Asifieka, Ministry of Niger Delta Affairs; Istifanus Fuktur Ministry of Solid Minerals; Christian Ohaa Min of Youth and Sports; Mr. A.G. Magaji, Ministry of Works and Housing (North). Others include Mr Louis Edozien, Ministry of Power; Jalal Arabi, State House (North); Mohammed Bukar, General Services Office, Office to Sec to Govt … (North); Abbas Mohammed, Ecological Fund Office, OSGF (North) ; Ugo Roy, Council Secretariat Aminu Nabegu, Special Services Office, OSGF (North). Bamgbose Akindele, Permanent Secretary, Political Affairs Office, OSGF; Alo Nwankwo, Economic Affairs Office, OSGF; Obiageli Nwokedi, Special Duties Office, OSGF; Innocent Ogbonnaya, Career Management Office, OHCSF; S.K.Y. Adelakun, Permanent Secretary, Common Services Office, OHCSF, and Mrs Nuratu Batagarawa, Service Policy and Strategies Office, OHCSF (North).